You are here: Home / Cookies / Drop Cookies / Chocolate Chip / Regis and Kelly Compost Cookie Success! Regis and Kelly Compost Cookie Success! After all my ranting about the Regis and Kelly Compost Cookie recipe, I made a batch following the recipe as printed (pretty much) on the show’s site. Guess what? They were fabulous! So what was the problem? Why did I get so many emails and comments from people whose cookies were thin puddles of salty goo? The problem must be the way we measure flour. If this recipe had included weights, it would have been more precise and fewer people would have had to throw out their dough. Below is how I made the cookies, but with some tiny alterations. I wouldn’t call them changes to the recipe because they were really just clarifications. The main thing was the flour was scooped with a heavier hand than average (5.1 oz per cup as opposed to 4.5 oz per cup), type of butter needed to identified and I felt the type of salt probably did too, since two teaspoons of salt is an awful lot unless you are using very coarse salt (like Diamond) and finally, the part about using a 6 oz ice cream scoop left me bewildered. Who has a 6 oz ice cream scoop? And how could a cookie made with a 6 oz measure bake in 9 minutes? I think in a professional bakery that could be done pretty easily, but in my kitchen the recipe required adjustments – a 1/3 cup measure worked. So try the cookies now! You’ll like them if you get the flour amount right. And if you’ve read the negative reviews so far, you’re probably a little hesitant. I don’t blame you, so I halved the recipe. This recipe is adapted from the clone recipe on Regis & Kelly. 3/4 cups semi-sweet or good chocolate chips – wouldn’t recommend regular chopped chocolate because it might cause more spreading. Best to stick with chocolate morsels/chips. 3/4 cup (more or less) broken peanut butter filled pretzels, Zapps potato chips, regular pretzels and pecans. The ¾ cup is approximate – use what seems good to you, but the peanut butter filled pretzels were awesome! In a stand mixer with the paddle attached, cream the cold butter, both sugars and corn syrup on medium high for 2-3 minutes until fluffy. Scrape down the sides of the mixing bowl. Add eggs and vanilla and stir to incorporate. Increase mixing speed to medium-high and run mixer for 10 full minutes. During this time the sugar granules will dissolve, the mixture will become an almost pale white color and mixture will double in size. By hand or using lowest speed of mixer, stir in the flour mixture – don’t beat it in or the cookies won’t be as tender. Stir in candies and salty things. Using about a heaping 1/3 cup measure or a stingy 4 oz measure, scoop up dough and form rounds. My scooped rounds weighed a little less than 4 oz each. Put the shaped rounds on a plate, cover with plastic wrap and chill for a few hours or until ready to bake. Heat the conventional oven to 400F. (350F in a convection oven). Arrange chilled cookie dough balls on a parchment or non-stick foil lined cookie sheet – mine was insulated. If your cookie sheets are thin, you might want to stack two and bake the cookies on the stacked cookies sheets. Bake 9-11 min (I baked mine for 12-13. While in the oven, the cookies will puff, crackle and spread. According to the original recipe, at 9 min the cookies should be browned on the edges and just beginning to brown towards the center. At 9 minutes, Mine were pale and doughy looking. Leave the cookies in the oven for the additional minutes if needed (it will be needed) and bake a total of about 12 to 14 minutes. All ovens are different so you’ll need to watch the cookies, specifically the edges. Cool the cookies completely on the sheet pan before transferring to a plate or an airtight container or tin for storage (I cooled mine on the sheet for only about 5 minutes, but mine were a tad bit overcooked so they were fine). Not sure of the true yield because I’ve only baked two. Yes, this post is about 4 years old so I’ve had a chance to buy the cookbook. If you don’t have it, I recommend it. She has a lot of other tips in the book as well. Hi Anna! think Christina Tosi uses bread flour in her cookie recipes…have you tried that? (I really enjoyed reading about of your efforts on these cookies – as I do all of your posts! Your research has helped me a number of times!) Thanks! I just tried these with: Whoppers, Raisinettes, potato chips, pretzels, semi-sweet and dark chocolate chips. I didn’t crush the snacks too much, just enough so the pieces weren’t huge. They turned out amazing! I made a double batch and I baked some right away after making dough balls and freezing for an hour or so — then the next day and the last dozen 3 days later. I must say, they were all good, but the 3-day-laters were the best. Needed 10 minutes of baking and stayed quite puffy/not flattened at all. I assume liquid evaporation helped the dough consistency over 3 days. I covered the dough with wax paper and foil (in the fridge, only froze right before baking). Just wanted to let you know I tried your adaptation of the recipe, and my cookies turned out amazingly well!! The only modifications I made were that I added 1 T of coffee grounds (too much coffee flavour for me, but my boyfriend didn’t even notice it! ), and 1/2 c oats. I used 6 oz scoops, which give me 9 cookies. They took 9 – 10 in the oven. I also think my salty snacks were either crushed too much or weren’t salty enough because I couldn’t taste them! I had used BBQ rice chips, pretzels, and graham cracker crumbs. My sweet ingredients were dark peanut butter cups, semi-sweet chocolate chips, and peanut brittle. hi there, the milk bar website says there are oats in these cookies. have you tried that? I actually liked the flavor of the homemade ones better (my roommate said there was no contest! ), and I think the texture will improve after chiilling the remaining dough awhile longer (I only baked six “testers” out of 18, chilled for about four hours). I finally made these. I was certain they were not turning out, as they looked burnt on the edges and raw in the middle. But I took them to Bible study anyhow. Everyone loved them! Thanks Anna. I used parchment, but maybe foil would make a difference? I’ll try it. Or different cookie sheets. I used potato chips, pretzels, the goldfish, rice krispies, chocolate chips, and some mini M&Ms. Nothing too spready, I think, but my cookies seem to spread alot in general. I use all purpose gold medal too. I’ll try a bit more flour added to a few cookies and see if that helps. Shari, it sounds like you did everything right. The cookies do spread a little, but they shouldn’t be thin. Mine were definitely fatter after a full 24 hours in the refrigerator. The eggs may have played a part in it, but I doubt it. What add-ins did you use besides the cheddar (ha ha) goldfish? Did you use cut up chocolate (as opposed to chips) or some sort of candy that might melt? Also, it could have had something to do with your cookie sheet. I’ve been using insulated cookie sheets. In the past, I’ve had more spreading on thinner cookie sheets. Are you greasing the cookie sheet or lining it? If you’re greasing it, the fat from the butter might be making the cookies slippery?? I’m grasping at straws here, but I do know sometimes greased pans make my cookies slip more before the heat locks in the crust. I baked most of my cookies on foil or non-stick foil. The non-stick foil has a slippery surface, but perhaps it’s not as slipper as a coating of fat? If all else fails, try adding another 1/4 cup flour. Maybe it was the brand of flour? I’ve been using unbleached all purpose Gold Medal, but in my experience bleached would be even more condusive to plumper cookies. I made these and they are positively addicting!! I found that even with weighing the (bleached) flour, chilling the dough, and doubling the cookie sheets my cookies spread to very thin. The edges were quite dark (which I actually kind of liked) and the centers barely cooked. I do have an oven thermometer, maybe it’s off and I should bake at 375 instead? It’s a regular oven, not convection. The other wild card is that I have home-grown eggs that might be more fresh and larger than standard. Should I be measuring my eggs? Anything else you can think of that may have caused this? Even with the spreading and uneven cooking, these cookies are great. The potato chips give the most interesting texture. Although I don’t recommend cheddar goldfish. The regular ones would probably be better! Steph, I used coffee grinds a while back and they tasted okay. However, when I rolled this particular dough in coffee grinds, I did NOT like the flavor. I’m not sure why they tasted so odd but the grounds (maybe it was the brand of coffee or the grind???) tasted kind of icky. So I recommend testing with one round of dough like you said you were going to do. Good luck with the cookies! I hope they turn out great. thanks, im glad i asked, i left them out. i have my dough balls chilling in the fridge, with heaping 1/3 measured scoops i yielded lucky 13 cookies. i think i too will roll a few in coffee grinds before baking, did yours turn out yummy? i make a chocolate lava cake that involves strong coffee in the recipe and it comes out super delectable so i think it could be a very good thing with these cookies. Because when I added broken up Heath bars, the fat from the chocolate in the Heath bar seeped into the dough and made the cookies that I added Heath bar to spread. Also, I think the toffee makes the cookies a little too sweet. I am glad I only added toffee to one cookie as a test. why, do you think they’ll sweat? do you suggest i smash them into itty bitty pieces or leave them larger? Good luck! Go easy on the Skor bars, though. hi, i will be making these later today for my hubby for our anniversary and im really grateful you went to all this trouble, i saw the segment on regis and was dying to make them but the website directions were a real let down. I did make these (and bake them) last night. Lacking several hours to refrigerate the dough, I put it in the freezer for 2 hours and 15 min. They took a REALLY long time to bake. Upwards of 20 minutes. (I’m thinking 22-24?) Oh, crap, I just realized, though, that I baked them at 350 (instead of 400-I don’t have a convection oven, LOL) No wonder! They did spread quite a bit, I was glad I only put four on a large (16×20) cookie sheet. Mine came out quite good. I would be definitely make them again, chilling the dough overnight. Okay, I’m an idiot, but are “coffee grounds?” the stuff in the basket thingy of the coffee maker after you make coffee? Yes, I used 3/4 cup EACH. I am going to bake up some more dough this morning. Maybe I’ll roll it in coffee grounds. Also, the chips were pretty crunchy today. The cookies were better on Day 1, though. Question: did you use 3/4 cup EACH of the chips and pretzels or 3/4 cup TOTAL? I am seriously considering these for the weekend baking spree. 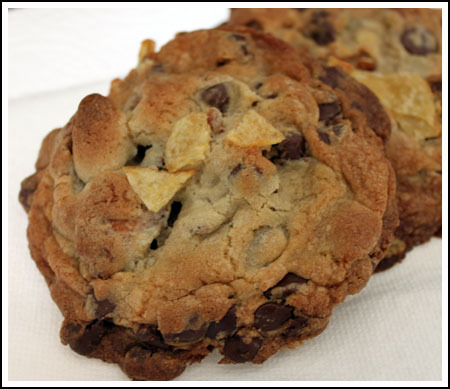 A cookie with coffee, chocolate and crunchy saltly sounds fantastic…. And I also want to know did the chips stay crunchy into the next day? Anna, I appreciate your time and effort to get these right. I am going to make these with my daughter…I have a ton of stuff I can toss in. Thanks for testing them and your tips! They look delicious! For those of you looking for peanut butter filled pretzels, I recently saw them @ Trader Joe’s. This recipe sounds fascinating. I am always intrigued by recipes with unusual ingredients. I found a peanut butter cookie recipe with bacon in it recently, which, along with the compost cookie, is on my list of “to try” recipes. My second batch turned out great too. I omitted the salt. I had plenty in the chips I added. I also found that I had to watch the oven time. When I cook them on a stone they turn out way better. My second batch was amazing and grabbed up quickly. I really want to try these – I’m curious how the dough holds up over time – especially the potato chips/pretzels in there – I hope you post a follow-up about how the cookies turn out after chilling overnight. Yes! They do! The texture is just right. I think the step of beating the mixture for 10 minutes might have something to do with it. I didn’t add the coffee grounds, so maybe I’ll throw a few into the next round of dough I bake up. Peanut butter filled pretzels!? Wowza those sound good. I’ll definitely keep my eyes peeled for those. Kudos to you for trying these after hearing so much negative about them!! I’m definitely going to give them a try. I’ll let you know when I do. Wow! Thanks for testing them out!! They sound delicious, I can’t wait to try them out! Thanks for the clarifications! Those sound and look like exactly what i am craving! I’ll have to look for the peanut-butter pretzels. I wonder if Combos makes a peanut butter filled pretzel? Zapps I probably can’t get, but I have seen other brands of kettle cooked chips, so I’m sure those will work. The peanut butter pretzels were those little nubby pretzels like the ones that come in Chubby Hubby flavored ice cream. I found them in a bulk bin at a Sprouts supermarket, but you can also find them at World Market/Cost Plus. As for Zapps, they were on sale so I picked some up. They’re really good kettle cooked chips. Apparently a lot of people like them because they seemed to be the most popular chip on the chip aisle at the time and there were lot of other chips on sale as well. I have never had peanut butter filled pretzels or Zapps chips. What are the chips like? I don’t think they sell “Zapps” brand in my local store. Those look really good and now I really want to make them. Due to time constraints I usually make the dough one day and bake the refrigerated dough the next day, would that work with this recipe, or would the add ins get soggy?